News Talk 610 CKTB :: Amanda Todd Suicide: Police Will Investigate – Larry Fedoruk :: Larry Fedoruk Blog. This isn’t about a quality baby boomer TV show. But it is about a topic that’s near and dear to my heart and that’s BULLYING. I opened my weekend Seek or Shout email this morning and on a page with only two entries I found this link from Larry Fedoruk’s blog about Amanda Todd. I really like Larry Fedoruk’s blog. He blogs about relevant issues not just fluff. I almost always write about fluff, but not this time. I hate bullies and after I watched Amanda Todd’s silent video where she was holding up pieces of paper that was the narration behind years of her pain I decided that I wouldn’t write about fluff today. UPDATE: I asked for permission to be a member of a “group” on Amanda Todd’s R.I.P. Facebook page and it’s a mixed emotion. First, I’m getting a lot of emails to my personal email account. Second, I found some awful things people have written on her R.I.P. page, things that Amanda’s parents will see and it just breaks my heart. It makes me upset that Facebook can’t do a better job of monitoring those pages. I even tried to report this person and when I did I found pages and pages of instructions from Facebook, but didn’t find a link or email address or any way to actually “report” this person. I’m inserting the item, but I’m warning you, it will piss you off and considering Facebook makes it impossible to report it and does nothing to stop it will piss you off even more. 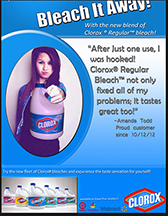 Someone thought it would be cute to make a bleach ad featuring Amanda Todd’s likeness.